Slow cookers are a wonderful convenience, but anytime you're dealing with low temperatures over long time periods, food safety is a concern. That's because the bacteria that cause food poisoning thrive and multiply rapidly at room temperature and up to 140 F.
Slow cookers are designed to cook foods slowly, at temperatures between 170 F and 280 F, a range that's well outside the ​food temperature danger zone. The key is making sure you're using your slow cooker properly. These simple slow-cooker safety guidelines will help keep you and your family safe. Make sure your slow cooker, utensils, and work area are clean and sanitized. Wash your hands before you begin to prep and while prepping, especially after handling raw meat or poultry. Keep perishable foods refrigerated until you need them. If you plan to prep meat or veggies ahead of time, keep them in the fridge until the last minute. 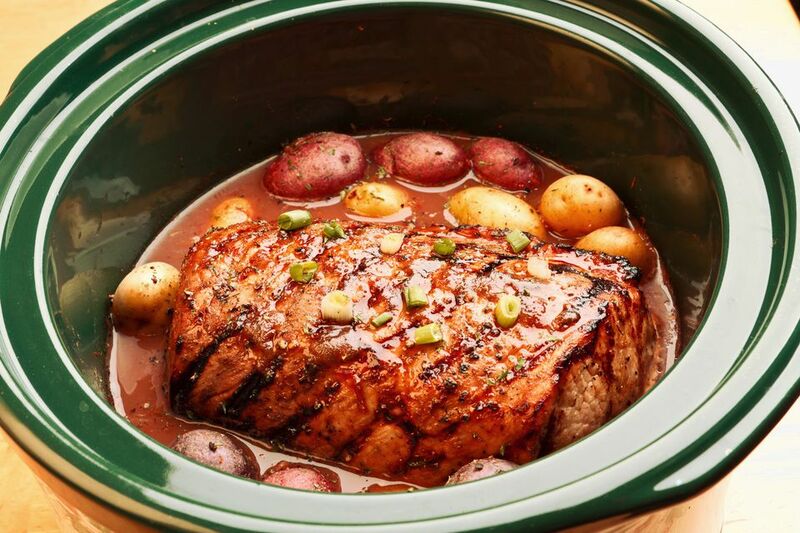 Your slow cooker might take a while to reach 165 F, which is widely regarded as the temperature at which most illness-causing bacteria are killed. Keeping ingredients in the fridge helps deny bacteria a chance to multiply wildly in those critical first hours of cooking. Don't put frozen or partially thawed meat or poultry into a slow cooker—they take longer to get to 165 F, and can also cool everything in the slow cooker. That's like building a bacteria playground. Veggies cook slower than meat or poultry, so put them in the cooker first, on the bottom. Then add meat or poultry, then cover with water, stock or broth. Keep the lid firmly in place, removing it only to check for doneness or stir. Moist foods like soup, chili, pasta sauce or stews are ideal for slow cookers because the steam that builds up makes for a very inhospitable environment for bacteria. Slow cookers like this programmable one generally have more than one temperature setting. It makes sense to use a lower setting if you plan to cook your meal all day, or if you're using less-tender cuts of meat. But if possible, set the cooker to its highest setting for the first hour, then lower it to your desired temperature. Once the food reaches and remains above 165 F, it'll stay safe as long as the cooker stays on. What if the power does go out? If you're at home, you can finish the cooking on a gas stove, an outdoor grill or anywhere else there's power. Whatever you do, do it immediately—don't give bacteria a chance to multiply. Unfortunately, if you're not home the only safe option is to throw the food away—even if it looks like it's done. Leftovers should be stored in shallow, covered containers and refrigerated within two hours. And don't try to reheat leftovers in the slow cooker, either. Reheat leftovers on the stovetop, in the microwave or the conventional oven, making sure it reaches a minimum internal temperature of 165 F as measured with an instant-read thermometer.